Established 30 years ago in a modest 2 block room, as a primary school, Saraswati now is the 14th highest ranked school in the country. 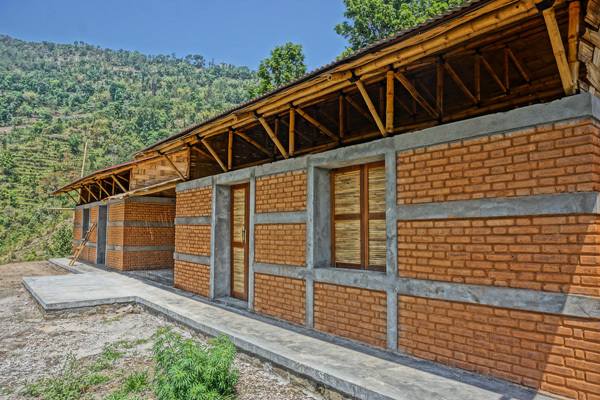 It is built in the remote Badalgaon village of Dhulikhel region, and the school now serves 210 students from kindergarten to grade 10; who come from economically poor and marginalized communities. This was all possible due to an inspirational Principle Ramesh Koju Shrestha, who has guided the school through the 30-year arduous journey. Despite having a poor road-access, lack of funds and authorities’ apathy, in his able leadership, he single handedly mobilised the local community to build the school. It is noteworthy that Saraswati does not charge any fees for children below Grade 5, Rs. 300 per month ($3 approx) for students between Grade 5 and 8 and Rs. 800 per month ($8 approx) for students above Grade 8. On the 24th April 2015, the school was among those that succumbed to structural failure and partial collapse due to the massive earthquake. The buildings were deemed unfit for occupancy and the classes had to be discontinued. The natural calamity brought a lot of curiosity and attention to our Learning Centre, in the neighbouring Simpokhari village, where our two storey rammed earth and bamboo building stood unscathed, while the whole village had collapsed. The principal came to visit us and approached us to rebuild his beloved school. Unfortunately at the time, due to our limited resources, we were only able to provide a temporary bamboo shelter so the classes could be resumed in a safe environment post-earthquake. But Mr.Koju’s relentless endeavours in keeping his students in school and improving the quality of education led us to raise funds and help realise his aspiration to have a permanent school building. 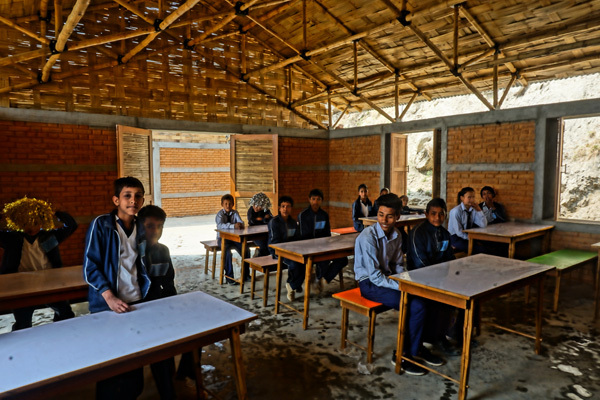 The AVAAZ Grant for our ground activity in local communities was channelled to help realize the construction of the school building and to create local enterprises. We are building 2 structures using our Government approved school design. Sita Travels and Vietnam for Nepal are financing the second 900 square foot building. 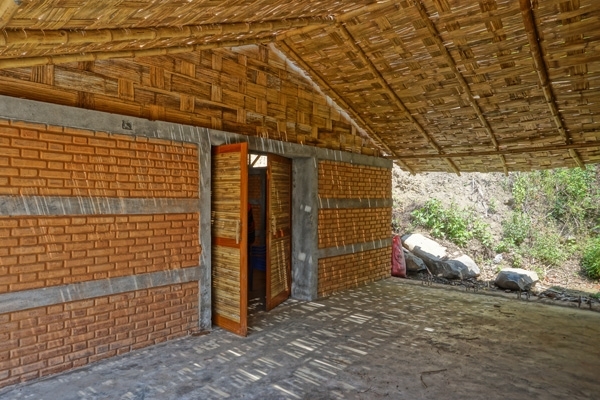 The design is compact and modular, with locally made Earth Bricks and a Bamboo roof truss. These bricks are made with local community members with the aid of our trainers. The raw materials - red clay and gravel (sourced within a radius of 5km) are compressed to a fine brick in a compact brick press that we designed for community building activities. 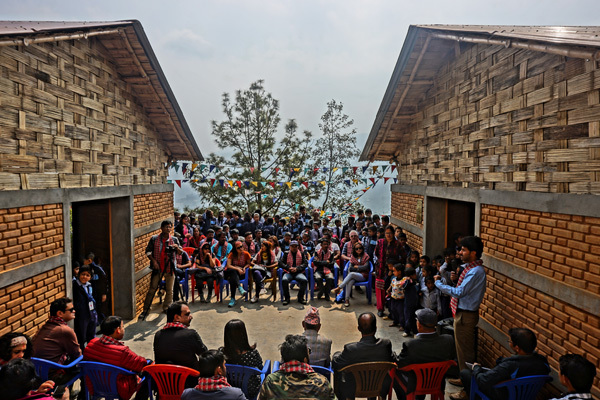 The gradual transformation from a social acquaintance to a community led public project has led us to envision this school to be a benchmark in local community schools, not just in terms of physical infrastructure but also in the standard of education for these bright young Nepali children. The building is in progress and we are pleased to see the locals participating and learning how to build with local resources. This experience will hopefully empower them to build their homes, also damaged in the earthquake, on their own. The school premises will also have a Tool Library for the local community members, where one can borrow tools to build their homes or create things, a sort of rural innovation centre. Slowly, we hope to develop an enterprise for the handicrafts or the skillset they can foster with the aid of this workshop space. This way, the school can be financially independent and can use the funds generated by the enterprise to upgrade its facilities for the students and teachers. Our aspiration to enhance schooling experience in rural Nepal by boosting the curriculum is the next big step. We want to usher in extra curricular activities like music, art, pottery and other means of expression. A custom designed course for the older students offer vocational skills such as furniture making or mason skills/carpentry and stitching etc to ensure female attendance and empowerment. This in collaboration with our infrastructure of the Learning Centre and Artist residency program in Simpokhari, a short walk from the school premises,by encouraging specialists/artists who stay here to interact with the children and broaden their schooling experience. The roof truss of the first two blocks are being put up. The preparation of roof trusses of the second two buildings are being done. Lime plaster was recently conducted. We hope to finish the complete 4 classrooms by the end of January 2016.